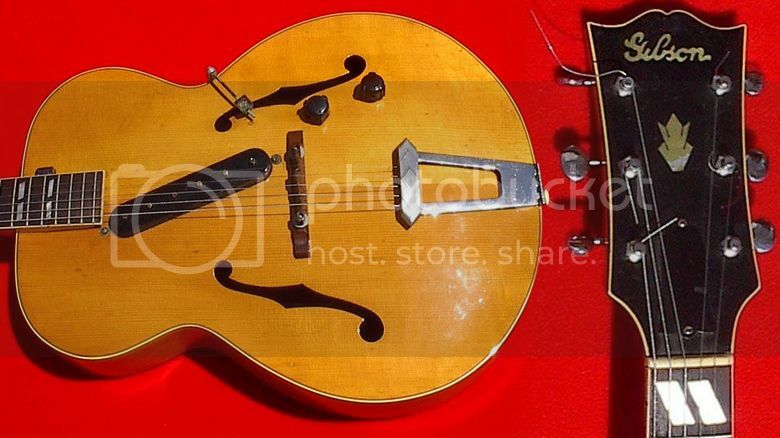 Guitar Blog: 1940 vintage Gibson ES-300 hollowbody guitar with the longest slanted pickup you ever saw! 1940 vintage Gibson ES-300 hollowbody guitar with the longest slanted pickup you ever saw! Slanted pickups on guitar were around a long time before Leo Fender designed the Telecaster and Stratocaster. Here we see a Gibson ES-300 from 1940 with a long slanted pickup which is very nearly 7 inches in length. Later examples had a shorter pickup, which was still mounted at a slant. This guitar comes in the original Geib 5 latch hard shell case (the seller claims that the case alone is worth $1,000), and is currently listed on eBay with a starting price of $6,500. Thanks to Andrew K for bringing this guitar to my attention.